Zombies take over San Francisco! Again! 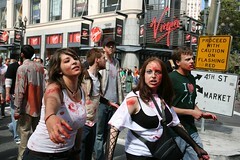 On Saturday, cute, bloody and scary zombies were all over downtown San Francisco. I got some video. Scott got some pix.